From High School to College: The Pratt Institute, Brooklyn, to Cornell University, Ithaca, NY. Leo Max Frank was a star student during his four college preparatory years at the Pratt Institute, which began in the fall 1898. In his senior year of high school (1902), at the age of 18, Frank was noted for his upcoming final challenge on the Pratt Institute debate team (Pratt Institute Monthly, June, 1902, p. 231). The interesting college prep course work and high marks that Frank earned at Pratt Institute rightfully earned him admission to Cornell University (Leo Frank High School Transcript, 1898 to 1902). In the Fall semester of 1902, Frank matriculated into Cornell (college tuition was only $100 a year at the time) in Ithaca, New York, starting on Wednesday, September 24. 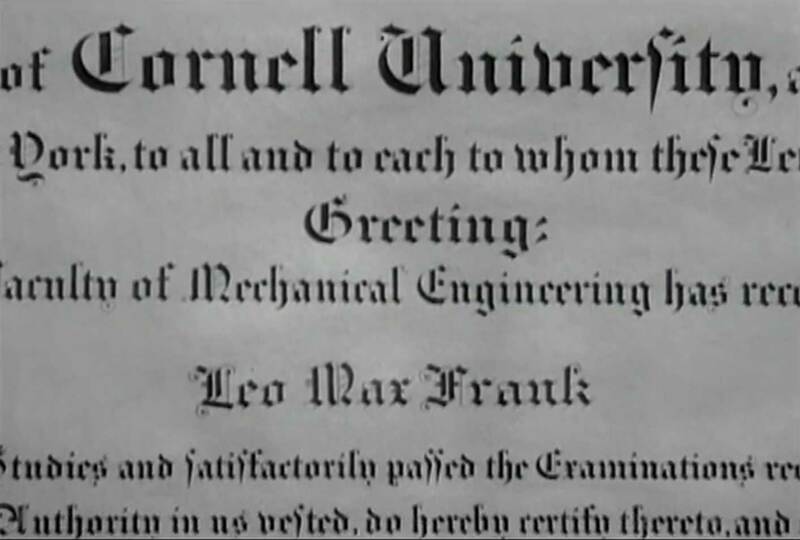 Frank studied at Cornell for four years until his college graduation ceremony in June of 1906 when he was honored with a bachelor’s degree (” title=”Leo Frank Cornell University Diploma Bachelor’s Degree, 1906″ target=”_blank”>Leo Frank Cornell University Bachelor’s Degree Certificate, 1906). During his tenure at Cornell, Leo Frank studied mechanical engineering and dabbled in numerous hobbies like photography and chess. Concerning athletics, Leo Frank participated in sports for four years playing basketball and tennis for his class team. Off the court, Leo Frank rose through the ranks of the debating team, becoming a master debater, and was promoted to a high-profile leadership position as a debating coach for the Cornell Congress of 1906. Frank attended numerous social affairs, and there are several surviving photographs of him, many of which appear to be quite lighthearted in nature, showing a serious Leo Frank with a fun-loving and campy sense of humor. In the summer of 1905 between his junior and senior year at Cornell, Leo Frank went on his first overseas trip to Europe with his uncle Moses. Together they visited various countries, meeting with extended family and associates. Expressing his creative side, Leo Frank used the opportunity to take several black-and-white photos of lovely landscapes (some of which survived into the 21st century). 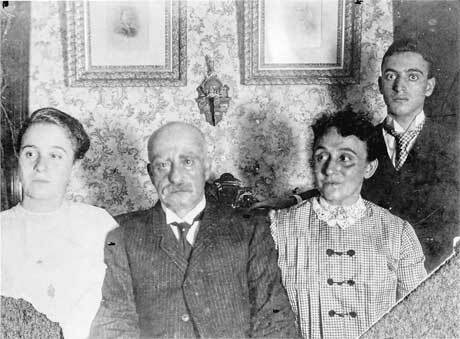 He spent quality time with his world traveling and savvy investor uncle, Moses Frank, who was sixty-three at the time, according to the original manifest documents (Ellis Island Ship Manifest Records, 1905; Retrieved 2013). Ellis island passage records revealed mostly when people arrived in the United States from overseas, not when they left. Departure records are archived overseas and will hopefully someday be put online (wanted). Steve Oney has one trip for Leo Frank in 1906, as a Cornell graduation activity, which is wrong, and not corroborated by official Records at Ellis Island or Cornell University Archive Documents. U.S. Passports were not always universally or generally required until 1917/8 with the unraveling of World War I. The history of passports is gray and murky in terms of its crisp, universal, agreed upon, and required use settled internationally around 1980. Passport requirements have become much more stringent in the 21st century than in decades past, because of increasing illegal human trafficking, global terrorist activity, gun smuggling, and drug running. During Leo Frank’s second overseas trip in 1907, he applied for a passport concerning his acceptance into a German apprenticeship in pencil manufacturing, where he put his height at 5’8″. The passport form that survived into the 21st century, interestingly enough, also describes Leo Max Frank’s facial morphological features (Leo Frank Passport Application, 1908). View Larger MapLeo Frank’s ten-day trans-Atlantic trip ended on September 24, 1905, when he arrived at Ellis Island with his uncle Moses Frank, on the S.S. Hamburg, they departed from Cuxhaven, Germany, on September 14, 1905 (Ellis Island Manifest Records, 1905, retrieved 2012). [The Hamburg] Built by A/G Vulcan Shipyard, Stettin, Germany, 1900. 10,532 gross tons; 521 (bp) feet long; 60 feet wide. Steam quadruple expansion engines, twin screw. Service speed 15 knots. 2,170 passengers (290 first class, 100 second class, 1,780 third class). Two masts and two funnels. Steel hull and four decks. Crew 225. Built for Hamburg-American Line, German flag, in 1899 and named Hamburg. Hamburg-Far East, New York from 1904, Genoa-NY from 1906 service. Interned at New York at the start of World War I in August 1914. Chartered in 1914 and renamed Red Cross. US Red Cross service. Renamed Hamburg in 1917. Seized by US Government, in 1917 and renamed Powhatan. US troopship service. Known as the USS Powhatan, SP 3013. Transferred to U.S. Shipping Board, in 1919. 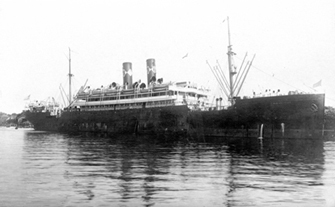 Chartered by Baltic S.S Corp. Of America, US flag, in 1920 and renamed New Rochelle. New York-Danzig service. Chartered by U.S. Mail Steamship Company, in 1921. Also New York-Danzig service. Renamed Hudson in 1921. Also New York-Danzig service. 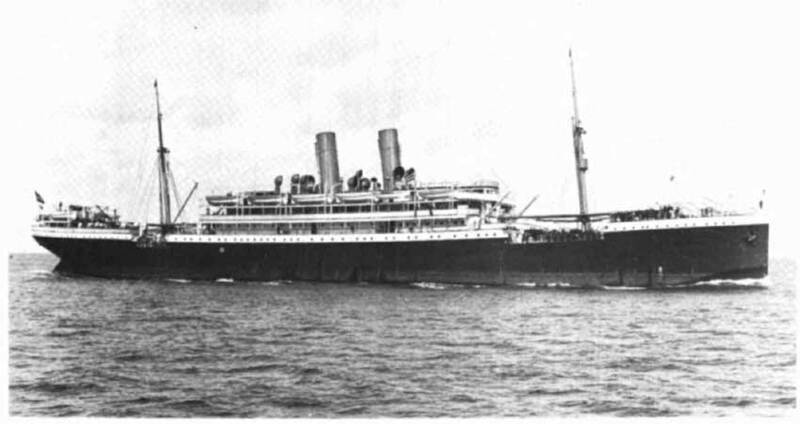 Chartered by United States Lines, in 1921. New York-Bremerhaven service. Renamed President Fillmore in 1922. Also New York-Bremerhaven service. Transferred to Dollar Line, American flag, in 1924. Around-the-world service. Scrapped in the United States in 1928. During his free time at his alma mater, Leo Frank engaged in amateur chess; some of his practice notebooks survived into the 21st century. He was fond of cards, especially poker, and had a mounted and framed royal flush on his dorm room wall. Though Leo Frank was an intellectual, he was not a sedentary. He loved to play tennis and would continue to do so socially after college. 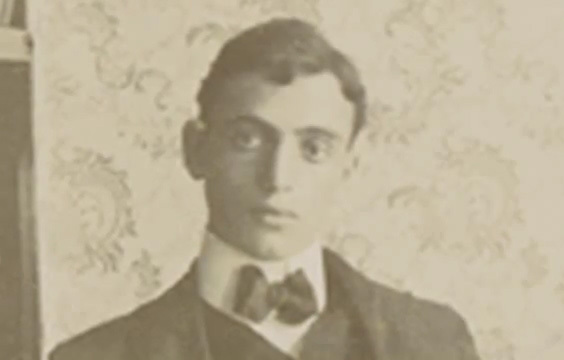 Considering all Leo Frank’s numerous extracurricular activities during his college years, he was a bit of a renaissance man, handsome, athletic, and scholarly. 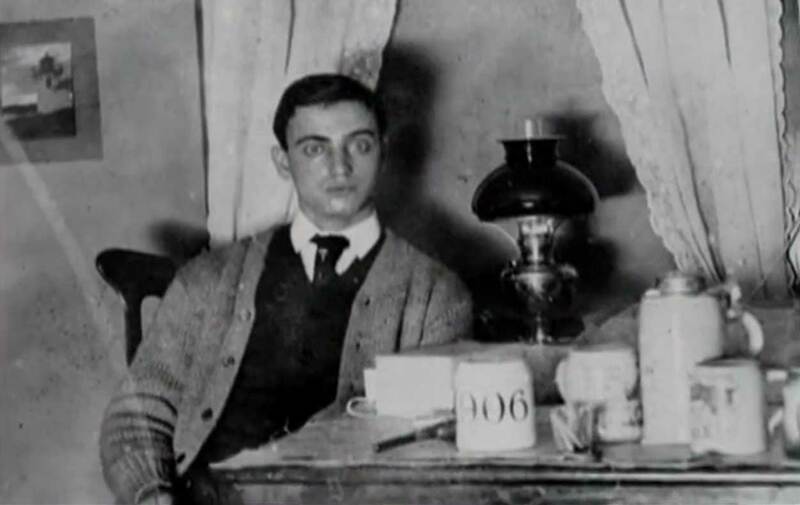 In some of his college photos, Leo Frank looked a little bit like the fictional character Donnie Darko (Jake Gyllenhaal), and mayhap he had another side to him too. Frank also spent his free time engaged in fraternal and social activities. 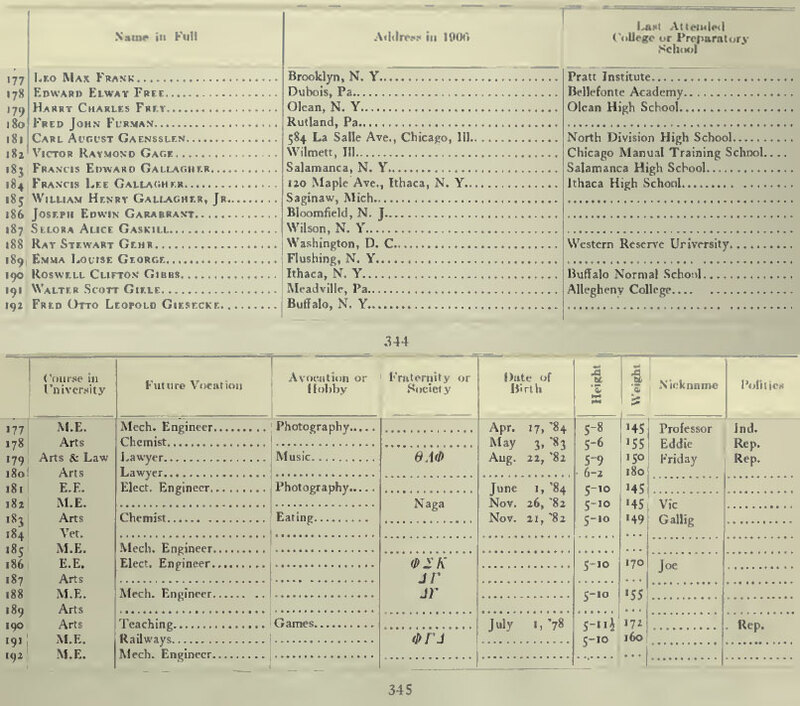 The 1906 Cornell yearbook has Frank listed as a member of the Cornell Society of Mechanical Engineering (CSME) and participating in photography as a hobby (Cornell Senior Class Book, 1906). 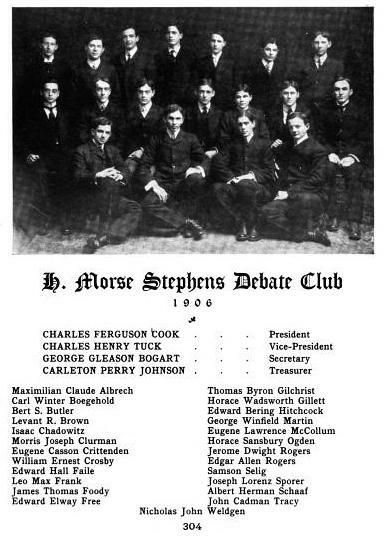 Most noteworthy, Leo Frank was an ascending member of the Henry Morse Stephens debate team 1902 to 1906, resulting in his promotion to the Cornell Congress leadership as debating coach in 1906 (Cornell Alumni Dossier on Leo Frank, retrieved 2012). If Frank’s participation in the multitude of experiences that defines college and his ability to multitask were any indication of his future potential, many doorways were sure to open for him, and he was destined for success in life. What does our intuition and instincts tell us about Leo Frank more than one hundred years later as we enter and pass the years 2013 to 2015, looking backward to 1913 to 1915 from the vantage point of dispassionate researchers? Leo Freak, his Dr. Jekyll and Mr. Hyde alter ego–something just isn’t right about him at times.Perhaps a posthumous core drilling sample of Leo Frank should be conducted to obtain his DNA, sequence it to determine its multifactorial genetic composition, and analyze patterns within his genetic equation, comparing those patterns with other violent criminals, felons, rapists, and pedophiles who murder children. It would help to determine if he was a products of genetics, environment, or both. Parallel processing supercomputers would make it possible to determine Frank’s genetic propensities concerning his physical and mental health, to see what gene patterns are linked probabilistically to behavioral patterns. Someday the technology will become available that will allow us to know with absolute certainty what happened that afternoon on Saturday, April 26, 1913 at minutes after twelve noon. Many people report being drawn into photos of Leo M. Frank because of his exophthalmic (bulging) and “lazy eyes” (exotropia). Leo Frank’s left pupil appears to be ever so slightly out of orbit laterally, giving the appearance he is looking in two slight to moderately different directions. Many people believe the way Leo Frank’s eyes appeared was perhaps a bit telling, more than just meets the eyes (no pun intended) as the saying goes. There seems to be a modern stereotype of the child molester having lecherous bulging eyes, but nothing could be further from the truth, pedophiles come in all sizes and shapes. Most psychologists and psychiatrists would contend that morphological eye features do not necessarily have a correlation with deviant behavior. The Old Police Reporter and journalist of the newspaper the Atlanta Georgian later claimed he sized up Leo Frank as a pervert the moment he looked at him and later wrote about the experience when he first saw Frank in court. Many people shown Leo Frank’s pictures in the 21st century have said similar things along these lines (to paraphrase). Maxofacial Morphological Prejudice: A new anti-Semitic conspiracy is uncovered because of the Leo Frank case. The Jewish community should consider doing research into experiments asking people to evaluate hundreds of photographs showing Jews with differing degrees Jewish stereotypical facial features to uncover the maxofacial levels of anti-Semitic prejudice interwoven in Gentile DNA. There seems to be a natural inclination in most people to sometimes judge other people not just by race, religion, or creed, but by other outward factors like facial morphological features for instance. From a medical diagnosis stand point, Leo Frank shows evidence of possible hormone imbalance issues (hyperthyroidism and Graves’ disease), and depending on those hormone imbalances, it could suggest he may have experienced physiological and psychological problems from the mixture of environmental and hereditary factors. And if the allegations hold some truth of Frank’s excessive consumption of ammonia spirits for his nerves, chain smoking cigarettes, and light whoring (presumably without Trojan condoms, he might have also been infected with an STD), those behaviors taken together could have posed serious health risks and possibly created serious mental imbalances, affecting not just his mind and body, but also behavioral propensities from time to time. However, Leo also seems to be a good-natured kind of guy, for the most part, social, jovial, gregarious, and willing to clown around in social settings. 1. 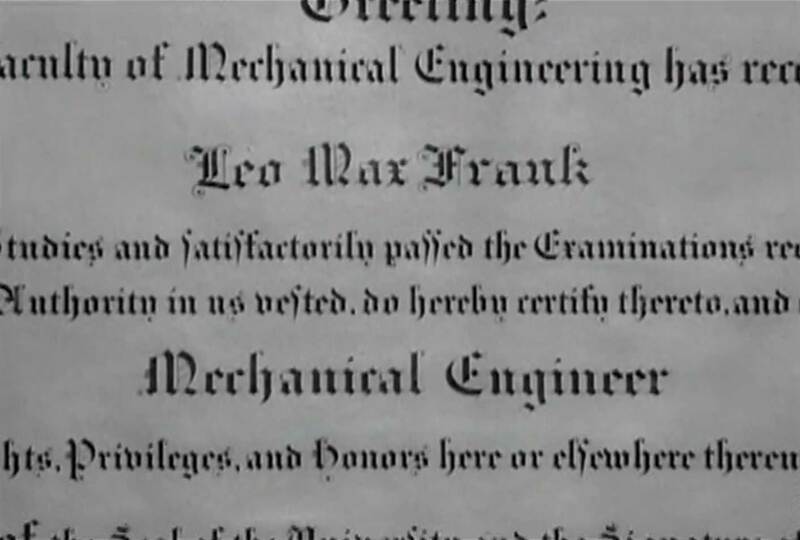 Majored in Mechanical Engineering (Cornell University Senior Class Book, 1906, p. 345, Row #177). 2. 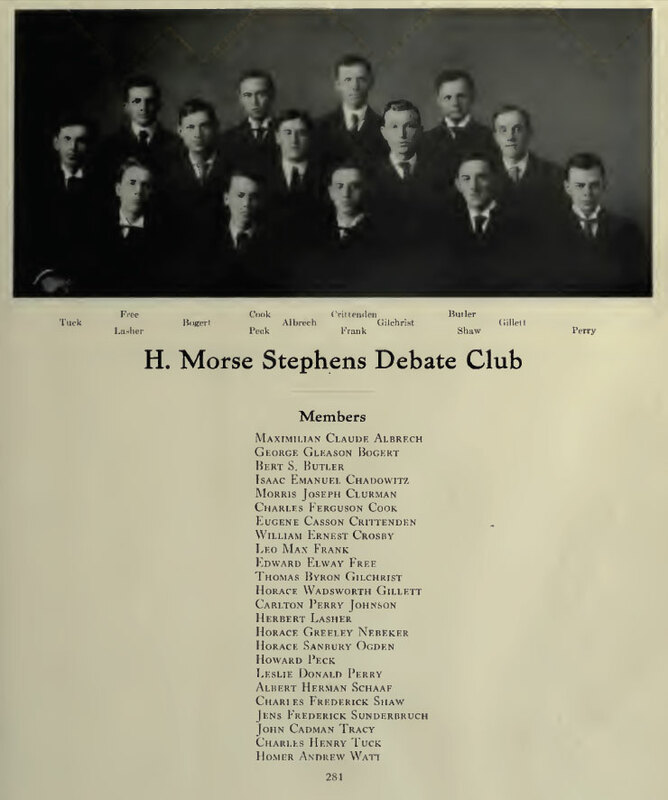 Participated in the Henry Morse Stephens Debate Club (Cornell University Senior Class Book, 1906). 3. Participated in the Cornell Congress at the leadership level, a political organization that debated issues of which he was coach (Cornell Alumni Archive Files, Ithaca, NY, accessed 2012). 4. Was a member of CSME – Cornell Society of Mechanical Engineers (Cornell Alumni Archive Files, Ithaca, NY, accessed 2012). 5. Played on the Cornell Class of 1906 Basketball Team for four years from 1902 to 1906 (Cornell Alumni Archive Files, Ithaca, NY, accessed 2012). Allegedly, photos did not survive into the 21st century. 6. Participated in amateur photography as a hobby (Cornell University Senior Class Book, 1906, page 345, Row: #177, Column: Avocation or Hobby). 7. Was politically registered as an Independent (Cornell University Senior Class Book, 1906, page 345, row #177, Column: Politics). 8. Was five foot eight inches tall and 145 lbs. (Cornell University Senior Class Book, 1906, #177, Height, page 345; Leo Frank Passport Application, Nuremberg, Bavaria, December 20th, 1907). Several Leo Frank partisan authors (Steve Oney, Albert Lindemann, and others) get his height wrong. They mistakenly put the 5’6″ height of Edward Elway Free located in row #178 erroneously for Leo Frank row #177 with a correct height of 5’8″. Source of this error page 344 and 345 of the Cornell Senior Year Book, 1906. 9. Was Nicknamed “Professor” (Cornell University Senior Class Book, 1906, p. 345, Column #1, row #177, Column #9 Nickname), partly because he became debate team coach. Leo Frank had developed a reputation for being long-winded and loquacious (Cornell Senior Class Book, 1906, page 79). Please Note: The staff of Cornell University report that concerning the dossier kept on file at Cornell University about Leo Frank, not all of the information about the activities and groups Leo Frank participated in are listed in the 1906 Cornell Senior Class Year Book or the period Cornellians (different from the Cornell Senior Class Book) reflecting the years of his attendance from 1902 to 1906. 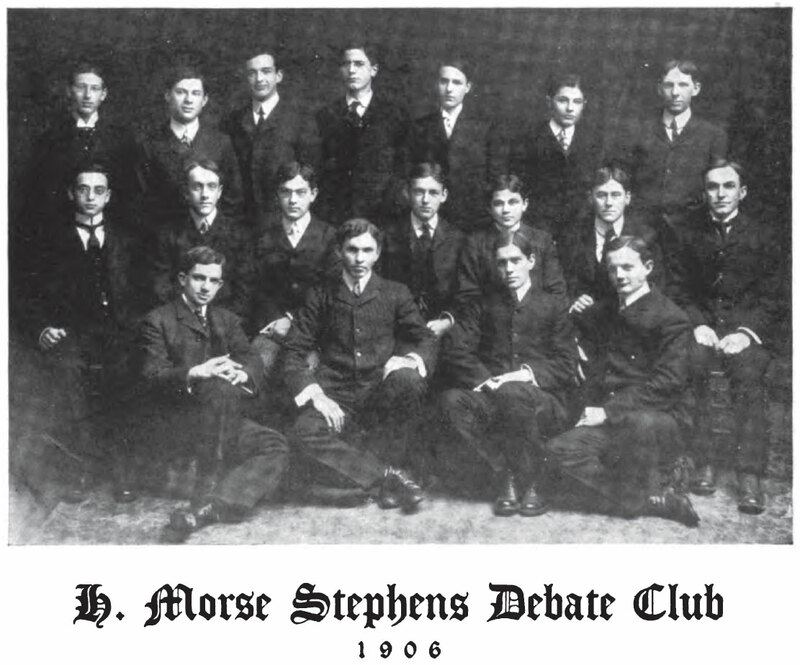 1904 Cornellian published about Leo Frank’s competing debate team for the class of 1906. The photo was taken in the year 1902 (when Leo Frank was 18), page 304. Built in 1899 in Germany for the Hamburg-America Line. Originally in Far East service. Transferred to Hamburg-New York trade in 1904. She was later used in Mediterranean-New York service. Interned in USA during World War I, confiscated in 1917 when United States declared war on Germany. Renamed as the SS Red Cross (1917), SS Powhatan (1917), SS New Rochelle (1920), SS Hudson (1921), SS President Fillmore (1922). Scrapped in the USA in 1928 (SS Hamburg History). After college, Leo Frank took a job in the summer of 1906 as a draftsman for the B.F. Sturtevant (Sturdivant) Company, in bone-chilling and frozen tundra Hyde Park, Massachusetts. Six months later, he returned to Brooklyn as the brisk chilly fall turned into a stone cold New York City winter. In 1907, Frank began a new job working for the National Meter Company of Brooklyn, NY, as a testing engineer and draftsman for about ten months. Although Leo M. Frank was Ivy League educated at Cornell University, the best school of higher education New York has to offer (no offense, Columbia), he was unable to connect with any kind of steady job until he discovered Atlanta — but not because he lacked talent — Leo Frank was a sharp cookie. A life-changing event was about to unravel as Leo Frank was invited by his Uncle Moses and a delegation concerning a manufacturing venture in Atlanta, Georgia. Next: The National Pencil Company of Atlanta, Georgia, 1907 to 1915. Pratt Institute Monthly, 1902 and 1903: June 1902, page 231, and February 1903, page 110. 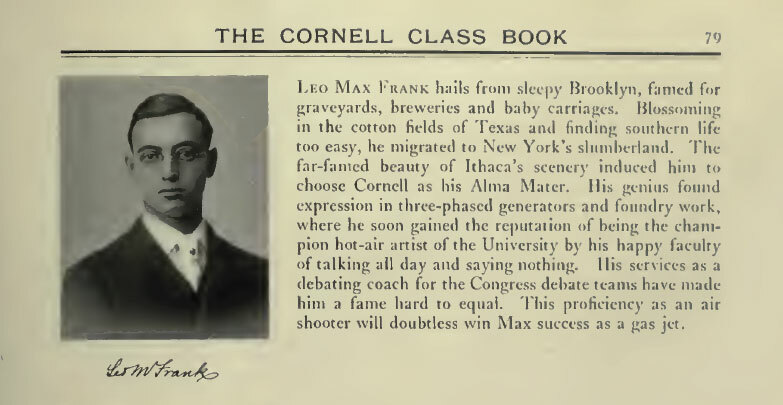 Cornell University (http://www.cornell.edu/) Alumni Dossier Files on Leo Max Frank Class of 1906, Ithaca, New York. Accessed 2012. 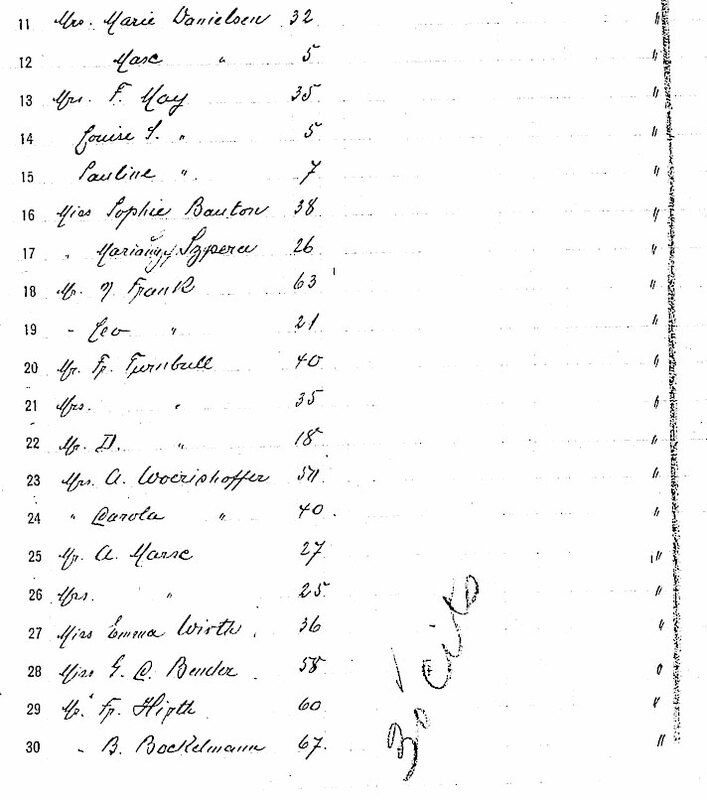 Ellis Islands Ship Manifest Records, 1905, indicates Leo Frank traveled to Europe. One prominent Leo Frank author, Steve Oney, erroneously describes it as a school trip in 1906. No records exist for a 1906 Leo Frank school trip abroad according to Cornell University or Ellis Island Ship Manifest Records. Visit: http://ellisisland.org/. 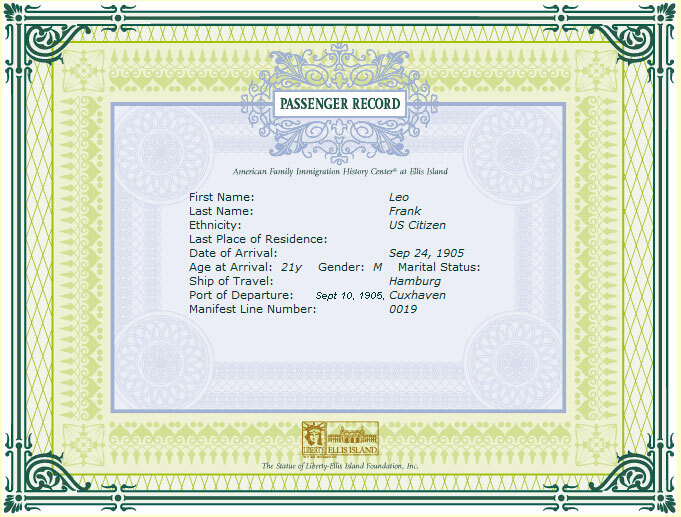 Leo Frank Journey Manifest Text Records, Ellis Island, 1905, http://ellisisland.org/. S.S. Hamburg Information, EllisIsland.org and Wikipedia.org (please support the betterment of these two websites by signing up and becoming an active member). Cornell University Senior Class Year Book, 1906 (first source of Leo Frank’s height at 5’8″, p. 345, row 177, column: height), https://www.leofrank.info/library/cornell-senior-class-book/cornell-senior-class-book-1906.pdf, and a copy available on http://www.Archive.org The Internet Archive at http://www.archive.org/details/CornellSeniorClassBook1906. The Cornellian: The Cornell University General Year Book, 1904, https://www.leofrank.info/library/cornellian/cornellian-1904.pdf, and a copy available on http://www.Archive.org The Internet Archive (please donate time and money to this massive treasure of world knowledge). 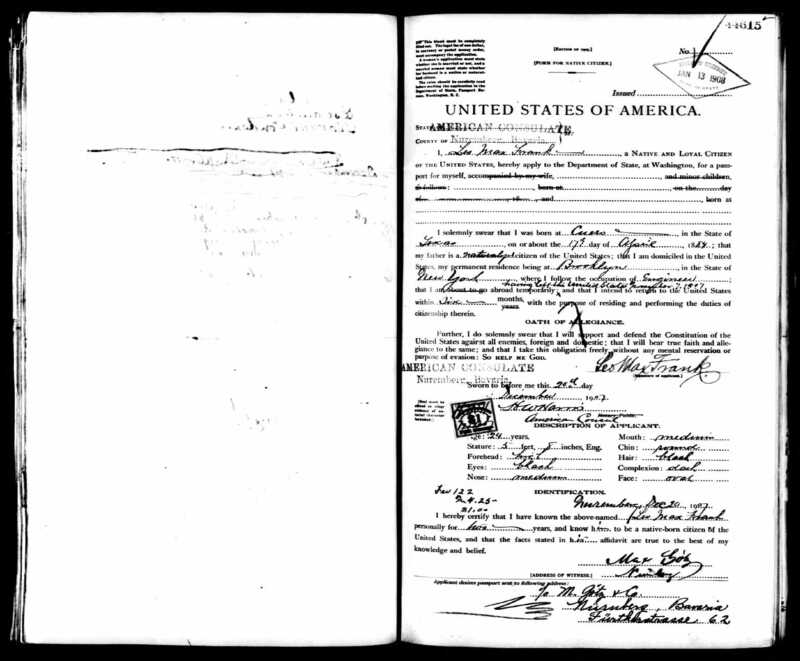 Leo Frank Passport Application, 1907 (second source for the 5’8″ height of Leo Frank), Leo Frank left the United States from New York City on November 7, 1907, on a cross Atlantic sojourn to the German Empire, later Nuremberg, Bavaria, December 20, 1907, notarized, official government stamp January 13, 1908. Available online at http://www.Ancestry.com, please sign-up and support this web site.